Palletized Conveyors : Modular conveyor system that uses pallets or trays to carry parts from one station to the next for machining or assembly applications. Pneumatic Conveyors : Pneumatic tube system that use low pressure air to either push or pull a short closed cylinder through a pipe between origin and destination, frequently only one way at a time. Conveyor belts includes flat belts, magnetic belts and trough belt conveyor. They are available for a wide range of applications and media transportation. Conveyor components includes all manner of parts and products used in the repair or replacement of components within a conveyor system. 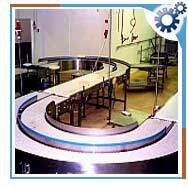 Inclined Conveyor : designed to move product between two different elevations. A well implemented conveyor system makes a positive difference in efficiency, safety, and profitability for manufacturing and distribution operations. Gears are used to drive heavy duty belt conveyors with multiple heads. Sprockets-they engage the links of a chain in the system. Worm gears - They offer corrossion protection. Ring gears - Increases or decreases the motion. Helical gears - They allow motors to be installed at right angle to the axis of equipment. Bevel helical gears - They are used as storage and retrieval unit. Planetary gears - Shares the transmitted load between the four planet wheels achieving high torque. They are used to drive heavy duty belt conveyors.